When does it all begin? Is it immediately after an overtime championship win, or is it on the way to Toronto the day of? Either way the defending Division 4 Champs the Detroit Chaos had only one thing on their minds.......DEFENSE??????????? The Chaos arrived in T.O. once again a little sluggish, welcoming two wet behind the ear rookies to the squad, it was yet again time to gel. 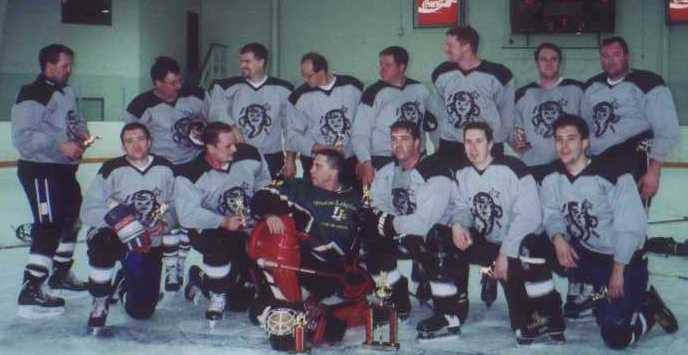 Terry "Where the heck are my gloves" Fidler and Brad "More Crown Royal Sir?" Lipski seemed unfazed by joining a team with such a glorious past. Indeed Fidler had Shaq size shoes to fill due to the untimely cow tipping accident to Dwight " Soul Glow" Channer. The Chaos however came out flying. The line of Fidler, Benninger and Totzke quickly connected, thus they were dubbed " The Cousin Connection". Benninger fed a pretty pass to Fids who gave the goalie a little hows she goin and etched his name on the score sheet. The second line of Winslow, Krappler and Belding punished the ladies from Chicago with their aggressive fore checking. By doing so they created a wealth of opportunities, though goals were hard to come by. With many trying to find their skating legs up here in the frozen tundra that is Canada, one line never broke stride, the "hustle" line. Todd " Stitches" Kjellenberg, Pete " HAAAAAAAAAY!!!!" McDonald and Mike " high stick to the neck" MacAskill showed the other two lines how to pressure the puck and obtain quality scoring chances. Defense played well, Joey youre a god. Ill talk about that later. Awaking Saturday morning two things were crystal clear, no one had been to the hospital and todays games were for Detroit bragging rights. Wanting to impress the scouts from the Bombers it was indeed time to step it up. With Fidler and Captain Chaos both scoring and assisting goals against Chicago the night before they looked to get #2 on track. So in the second period after Benninger and Winslow each tallied, the sophomore arrived. First he found a loose puck in front of the net and managed to sneak it by the keeper 3-0. Moments later Totzke scooped up the puck in the neutral zone skated down the right wing and let a laser beam go which handcuffed the goalie 4-0. Then Benninger broke down the defense and had the goalie at his mercy, one problem the puck sat inches from the goal line. Totzke making like a kid at Christmas took the gift and ran 5-0. The scoring would continue and when Lipski gave Benninger a beautiful tape to tape pass Captain Chaos walked in all alone and beat the goalie like a rented mule. The defense once again played outstanding. Rotating 5 defensemen the Chaos stayed fresh, thus holding the opposition to weak and almost embarrassing opportunities. Joey youre still a god! After a delicous breakfast(thanks Steve) and a quick massage in robo- chair it was time for the key match-up, the Bombers. There is a long and heated past with several players on both teams, emotions were definately running high in the dressing rooms. The Bombers seemed up for the challenge ,after all the Chaos hadnt allowed a goal yet. Each team had its chances, however Joey proved to be their Federovs, Felix Potvin. Somebody shouldve called the cops cause there was some serious larceny goin on (with a little help from the iron). When our third line got us on the board we had some breathing room. It seemed as if the Bombers were content to take Benninger out of the play and make others beat them. BAD MOVE!!! In the second period when #5 the marked man picked up the puck in the centre ice area and cruised into the Bombers zone both defencemen quickly moved to him which left Totzke all by his lonesome. Captian Chaos delivered a pretty little drop pass which Totzke one-timed to beat the keeper. That would prove to be more than enough as we would walk away with a 3-0 win. Now that our Saturday games were finished there was only one thing to do!!!! REST. Ya right ! We had just walked through the round robin, not allowed a goal and Kappy was hardly in the box. It was time to celebrate. The party quickly formed in the cheerleaders room(go figure) and didnt take long to hit full stride. With somebody starting a bottle cap in wine contest things could only get worse. Everyone drank responsibly, Theresa made sure of that(HEE HEE!!!). So we waited long into the evening to let loose(5:30pm) when Theresa was in bed. Andy why were you in bed at 3:00pm? You know you were just asking for a wake up call.TIME FOR SOME DINNER "ONSTAR, Can I help you Mr. Lovell?". Off to Arizona B-Bar& Grill, great dinner(thanks Mike) a couple of drinks then off to bed, right Andy. Sunday morning and the Championship game came pretty doggon early, but everyone answered the bell, wait, wait no they didnt, it seemed we were a right winger short. With McDonald praying to the porcelain gods, it was Lovells big chance to jump on offence and he didnt disappoint the audience, working hard along the boards. Joey who did end up at the right hotel played phenomenal shutting down the Bombers once again. The game played out with not as much drama as was expected. The Bombers were undermaned and basicly couldnt play at our level. Though Joey and our defence allowed them to score twice, it gives our entire team something to shoot for next year, NO GOALS. 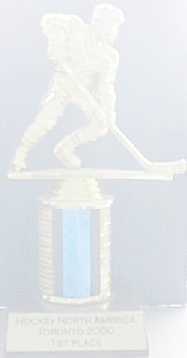 Now that another great tournament is behind us, let me leave you with a couple of pieces of advice......Goldschlager is no longer welcome(although it is better than shots of rye), styrofoam coolers are banned from the premesis, never eat chips in bed, always double check your hockey bag as to not forget anything ie. gloves, robo-chair isnt all its cracked up to be, we do have the best fans/cheerleaders on the face of the planet, no naps in the afternoon(unless you deadbolt your door), drinking wine is fine, sleeping at 5:30pm not so fine, it wasnt a skunk it was you Fids, climbing through 2nd floor hotel windows is not the best idea unless Kappy is helping you up, "this is a hotel not a prison", next year well be fighting for jobs as two important keys will hopefully be returning Channer and White, and always remember hockey is a game of win and lose, or in our case just win.